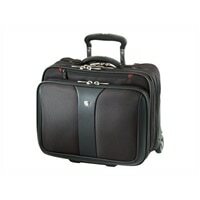 Swiss Gear Patriot Wheeled Computer 2-Piece Business Set - Roller Fits Laptops with Screen Sizes up to 17-inch and Laptop Case Fits up to 15.6-inchThe Patriot Wheeled Computer Case from Swiss Gear lets you organize for the day's chores easily fitting most 17 inch laptops. For easy moving around it features chrome accented 3" wheels and chrome accented recessed carrying handle. It incorporates an organizer compartment for pens, business cards, phone and more, a spacious overnight compartment that fits clothes for the next day and a Fan-file compartment. The zippered compartment stores trolley handle when not in use thus saving space. It has a trolley strap that keeps bag in place on a rolling suitcase making it stable. It also features interior stretch mesh pocket making it safer for your stuff and an ideal companion for a trip. The Patriot Wheeled Computer Case from Swiss Gear lets you organize for the day's chores easily fitting most 17 inch laptops. For easy moving around it features chrome accented 3" wheels and chrome accented recessed carrying handle. It incorporates an organizer compartment for pens, business cards, phone and more, a spacious overnight compartment that fits clothes for the next day and a Fan-file compartment. The zippered compartment stores trolley handle when not in use thus saving space. It has a trolley strap that keeps bag in place on a rolling suitcase making it stable. It also features interior stretch mesh pocket making it safer for your stuff and an ideal companion for a trip.